The building is located at the corner of East 17th Avenue, between Grant and Logan Streets, and the Office Suite is on the 5th floor of the building. The office is located immediately east of the central business district of downtown Denver, making street parking relatively easy to find. There are parking meters which take both coins and credit cards located directly in front of the building on East 17th Avenue, and on the side streets, particularly on Grant Street. In addition to parking meters, there is hourly-rate pay guest parking available in the attached parking garage during regular business hours. The entrances to the parking facility are on Grant Street or Logan Street. While guest parking is available in the attached parking garage which charges for parking on an hourly rate. If you are travelling to our office, you can get directions from Google. Take I-25 South to US-40/US-287/Colfax Avenue exit (Exit Number 210A). Exit and turn left on Colfax Avenue (heading East). Go 3 blocks past Lincoln Street, and turn left on Logan Street (heading North). Take Logan Street (North) to East 17th Avenue. Our offices will be on the left side, or the Northwest corner. Take I-25 North to Exit 201A US-40/US-287/Colfax Avenue. Turn right on Colfax Avenue (heading East). Go 3 blocks past Lincoln Street, and turn left on Logan Street (heading North). Take Logan Street (North) to East 17th Avenue. Our offices will be on the left side, or the Northwest corner. Take Colfax Avenue (heading West) until you reach Logan Street. Turn right on Logan Street (heading North). Take Logan Street (North) to East 17th Avenue. Our offices will be on the left, or the Northwest corner. An alternative from Colorado Boulevard is to take East 17th Ave to East 18th Ave (17th turns into 18th Avenue which is a one way street – heading West). Turn left on Grant Street (heading South). The building is at East 17th Avenue (one block) on the left, or the Northeast corner. Take US-6 (6th Avenue) heading East. Stay on 6th Avenue Eastbound and go 3 blocks past Lincoln Street. Turn left on Logan Street (heading North). Take Logan Street (North) to East 17th Avenue. Our offices will be on the left, or the Northwest corner. 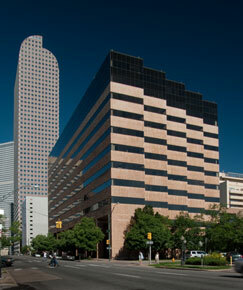 The nearest train stop is at 16th Street (16th Street Mall – Downtown Denver). From the 16th Street Mall, you can walk or take the free shuttle bus East to the Broadway Station. From the Station, walk North on Broadway to 17th Avenue. Turn right on 17th Avenue, and walk East 3 blocks until you reach Grant Street. From Denver International Airport, take Pena Boulevard to I-70 West. Exit I-70 at Colorado Boulevard and turn left (heading south). From Colorado Boulevard turn right onto 17th Avenue. Stay on East 17th Ave to East 18th Ave (17th turns into 18th Avenue which is a one way street – heading West). Turn left on Grant Street (heading South). The building is at East 17th Avenue (one block) on the left, or the Northeast corner.